Oleg Paliy, associate professor of biochemistry and molecular biology at the Boonshoft School of Medicine. Researchers from the Department of Biochemistry and Molecular Biology at the Wright State University Boonshoft School of Medicine and the Department of Nutrition and Food Science at the University of Granada School of Pharmacy in Granada, Spain, have shown how changes in diet can negatively affect human health. Their research, “Dietary Fatty Acids Sustain the Growth of the Human Gut Microbiota,” was published online in Applied and Environmental Microbiology, a journal of the American Society for Microbiology. 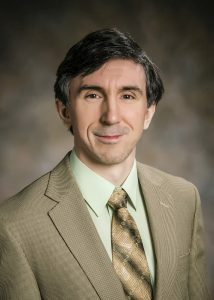 Oleg Paliy, Ph.D., associate professor of biochemistry and molecular biology at the Boonshoft School of Medicine, is the corresponding author of the study. Through an experimental apparatus they created, called a human gut simulator, the researchers showed that human gut microbes can quickly adapt from a well-balanced diet to one composed of dietary fats. The human gut simulator was designed to mimic the environment of the human colon and allows researchers to study the effects of different diets on gut microbiota without stressing human subjects with extreme diets. Their research showed that when carbohydrates and proteins were removed from the diet but fats remained, the production of short chain fatty acids dropped, along with anti-oxidants, which are also healthy. “This can have potentially negative health consequences on the human body,” Paliy said.